Just over two years ago, running back Derrick Henry was drafted by the Tennessee Titans in the second round of the 2016 NFL Draft to contribute to the Titans’ “Exotic Smashmouth” offense alongside running back DeMarco Murray. Henry was drafted to be a battering ram on offense, with his large frame, power, and speed set to tear through defenses on the ground. Fast forward to yesterday, as Henry sits on the sideline of the potential game-winning two-point conversion from the one-yard line. The Titans’ 6-foot, 3-inch running back wasn’t even on the field for a key play, from which the Titans needed just a yard to win the game. The simple fact is, given Henry’s recent production, keeping him off the field wasn’t necessarily a poor decision. In fact, he should very rarely be on the field. Dion Lewis is the better running back, and he deserves a bell-cow role in Tennessee. Admittedly, Lewis hasn’t gotten off to the best start for his new team. Prior to yesterday, Lewis averaged just 2.33 yards after contact per attempt compared to 2.90 for Henry. Lewis had 12 missed tackles forced rushing compared to Henry’s 14. Lewis clearly had an edge in the passing game with 27 targets and 135 receiving yards compared to just six targets and 17 receiving yards for Henry, but even there he had his fair share of struggles with two drops and only 1.13 receiving yards per route run. 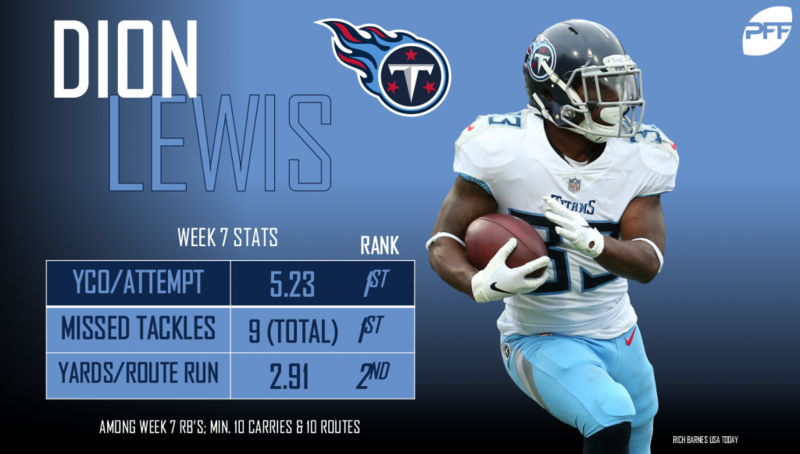 London brought out the best in Lewis, though, as his performance was more reminiscent of his standout play last season than it was of his sluggish start to the 2018 season. In 2017, Lewis ranked second behind only Alvin Kamara in overall grade at the running back position. He forced 45 missed tackles on the ground (t-4th most) and averaged nearly three rushing yards after contact per attempt. Those traits of making people miss and picking up extra yardage after contact were prevalent in Lewis’ performance against the Los Angeles Chargers. On the day, Lewis forced nine missed tackles as a runner and a receiver and averaged 5.23 rushing yards after contact per attempt, which also led all running backs with at least 10 attempts this week. His ability to make defenders miss was on display all game, including this second quarter run. After navigating through a crowd at the line of scrimmage, Lewis found himself one-on-one with Denzel Perryman in the open field. Perryman had Lewis lined up, but a quick cut by the shifty back was all it took to make Perryman miss the tackle. No play displayed Lewis’ tackle-breaking abilities more than his highlight-reel run late in the fourth quarter, however. With the Titans driving for a potential game-tying touchdown, Lewis burst through the line of scrimmage on this power run, ran through an arm tackle at the second level, spun out of three other tacklers, and rumbled down the field for additional yardage. His ability to keep his balance through contact was key, and it helped get the Titans in range for the touchdown that they needed in a critical juncture of the game. Meanwhile, Henry ran just 12 times for 33 yards in the game. He didn’t force any missed tackles on the ground, he didn’t break off any runs of 15 or more yards for the seventh straight game, and he averaged just 2.08 yards after contact per rush. He has now been out snapped by Lewis 159 to 85 over the last four weeks, and it is becoming clear that Lewis is taking on a lead back role. Lewis hasn’t been great to start the season, but he is coming off a season in which he was the second-best running back in the NFL. Yesterday, he looked a whole lot like that same running back as he gashed the Chargers on the ground and through the air en route to 155 yards from scrimmage. His performance showed just what he is capable of if given a bell-cow role. Given Henry’s lack of production when on the field, the trend in the Titans’ backfield should continue, and Lewis should continue to see even more of the field.